Many believers are not aware of the baptism in the Holy Spirit that the Lord Jesus came to give us. Due to a lack of proper teaching some bellevers confuse the baptism of the Holy Spirit with a gathering filled with noise, shouting, shrieking and other weird expressions. They do not understand the purpose and power of the baptism of the Holy Spirit. 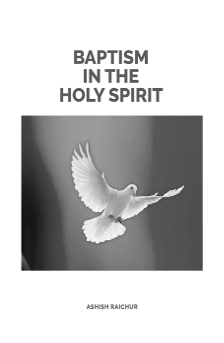 This simple study in God's Word is intended lo help us understand what the baptism in the Holy Spirit is, and then lead us into receiving this for ourselves. This is the beginning of a wonderful journey to manifest the power of the Holy Spirit Every believer must receive the baptism in the Holy Spirit and then journey into being a channel of all of the gifts of the Spirit, so that God's power can be revealed and Jesus can be glorified!